Rifampin is used in conjunction with other antituberculosis agents for the treatment of clinical tuberculosis. The American Thoracic Society (ATS), US Centers for Disease Control and Prevention (CDC), and Infectious Diseases Society of America (IDSA) currently recommend several possible multiple-drug regimens for the treatment of culture-positive pulmonary tuberculosis. These regimens have a minimum duration of 6 months (26 weeks), and consist of an initial intensive phase (2 months) and a continuation phase (usually either 4 or 7 months). 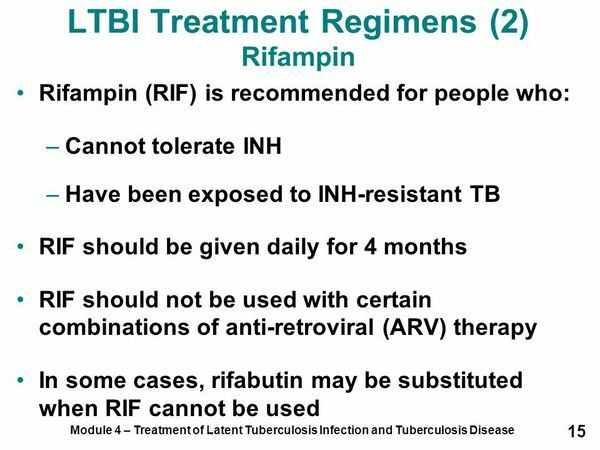 Rifampin is considered a first-line antituberculosis agent for the treatment of all forms of tuberculosis caused by Mycobacterium tuberculosis known or presumed to be susceptible to the drug, and is an essential component of all short-course regimens. Rifampin is commercially available in the US alone or in fixed combination with isoniazid (Rifamate®) or in fixed combination with isoniazid and pyrazinamide (Rifater®). The fixed-combination preparation containing rifampin, isoniazid, and pyrazinamide (Rifater®) is designated an orphan drug by the US Food and Drug Administration (FDA) for use in this condition. Although oral rifampin is preferred for the treatment of tuberculosis, the drug may be given IV for initial or retreatment of the disease when the drug cannot be given orally, and IV rifampin is designated an orphan drug by the FDA for use in this condition. When use of rifampin in conjunction with other antituberculosis agents is being considered for the treatment of tuberculosis or other mycobacterial infections (e.g., Mycobacterium avium complex [MAC] infections) in patients with human immunodeficiency virus (HIV) infection, the possibility that concomitant use of certain drugs might be contraindicated or drug dosages may have to be altered because of clinically important pharmacokinetic interactions between rifampin and certain antiretroviral agents (e.g., HIV protease inhibitors, nonnucleoside reverse transcriptase inhibitors [NNRTIs]) should be considered. Because of the pharmacokinetic interactions between rifampin and HIV protease inhibitors or NNRTIs, the CDC and other experts previously stated that use of rifampin was contraindicated in patients receiving these antiretroviral agents and that use of rifabutin-containing regimens was the preferred alternative for the treatment of active tuberculosis in HIV-infected patients receiving HIV protease inhibitors or NNRTIs. However, the CDC and some experts now suggest that there are specific circumstances when HIV-infected patients with active tuberculosis can receive rifampin concomitantly with certain HIV protease inhibitors or certain NNRTIs. Rifampin can be used in patients receiving the following antiretroviral regimens (with appropriate dosage adjustments): efavirenz and 2 nucleoside reverse transcriptase inhibitors; ritonavir and 1 or 2 nucleoside reverse transcriptase inhibitors; or an antiretroviral regimen that includes both ritonavir and saquinavir. There is evidence that use of antituberculosis regimens that include once- or twice-weekly administration of rifamycins (e.g., rifampin, rifabutin, rifapentine) in HIV-infected patients with CD4+ T-cell counts less than 100/mm3 is associated with an increased risk for acquired rifamycin resistance. Therefore, until additional data are available regarding this issue, the CDC recommends that HIV-infected individuals with CD4+ T-cell counts less than 100/mm3 not receive rifamycin regimens for the treatment of active tuberculosis that involve once- or twice-weekly administration. These individuals should receive daily therapy during the initial phase, and daily or 3-times weekly regimens during the second phase; directly observed therapy also is recommended for both the daily and 3-times weekly regimens. Rifampin is used alone or in conjunction with other antituberculosis agents for the treatment of latent tuberculosis infection to prevent the development of clinical tuberculosis, especially in individuals exposed to isoniazid-resistant M. tuberculosis. Previously, “preventive therapy” or “chemoprophylaxis” was used to describe a simple drug regimen (e.g., isoniazid monotherapy) used to prevent the development of active tuberculosis disease in individuals known or likely to be infected with M. tuberculosis. However, since use of such a regimen rarely results in true primary prevention (i.e., prevention of infection in individuals exposed to infectious tuberculosis), the ATS and CDC currently state that “treatment of latent tuberculosis infection” rather than “preventive therapy” more accurately describes the intended intervention and potentially will result in greater understanding and more widespread implementation of this tuberculosis control strategy. While a 9-month regimen of isoniazid monotherapy (once-daily or, alternatively, twice weekly) generally is considered the regimen of choice for the treatment of latent tuberculosis infection in most adult and pediatric patients and a 6-month regimen of isoniazid monotherapy (once-daily or, alternatively, twice weekly) is considered an acceptable alternative in some cases, a 4-month regimen of daily rifampin monotherapy also has been studied and can be considered as an alternative for the treatment of latent tuberculosis infection in selected individuals. Although a 2-month daily regimen of rifampin and pyrazinamide and a 2- to 3-month regimen of twice-weekly rifampin and pyrazinamide were previously recommended, these regimens have been associated with an increased risk of hepatotoxicity and generally should not be offered for the treatment of latent tuberculosis infection unless the potential benefits outweigh the risk of liver injury and death. A 4-month regimen of daily rifampin monotherapy is considered by the ATS and CDC to be an alternative regimen that can be used for the treatment of latent tuberculosis infection in both HIV-infected and HIV-seronegative adults. This rifampin regimen may be useful for those in whom isoniazid cannot be used because of drug resistance or intolerance. The AAP states that, when treatment of latent tuberculosis infection is indicated in a pediatric patient who is a contact of an individual with tuberculosis and there is a possibility of isoniazid-resistant organisms, treatment should be initiated with a regimen that contains both isoniazid and rifampin. If the source case is found to have isoniazid-resistant M. tuberculosis, isoniazid should be discontinued and rifampin continued for a total course of at least 6 months. The AAP states that optimal regimens for treatment of latent tuberculosis infection in pediatric patients with strains resistant to both isoniazid and rifampin are unknown; however, a multiple-drug regimen and consultation with a tuberculosis specialist is indicated. Limited data suggest that a 2-month regimen consisting of rifampin and pyrazinamide given daily is effective in treating latent tuberculosis infection in HIV-infected patients, and the ATS and CDC state that the efficacy of this regimen is not expected to differ in HIV-negative patients. In a randomized, comparative study in HIV-infected adults, the efficacy and safety of a rifampin-pyrazinamide regimen given daily for 2 months was comparable to that of a 12-month regimen of isoniazid monotherapy for treatment of latent tuberculosis infection. An intermittent rifampin and pyrazinamide regimen that involves twice-weekly administration of the drugs for 2-3 months also may be effective for the treatment of latent tuberculosis infection when other regimens cannot be used. Based on results in HIV-infected adults, the ATS and CDC previously recommended use of the 2-month daily rifampin and pyrazinamide regimen for HIV-infected or HIV-seronegative adults who were known contacts of patients with isoniazid-resistant, rifampin-susceptible tuberculosis. However, hepatotoxicity (including some fatalities) has been reported in patients receiving rifampin and pyrazinamide regimens for the treatment of latent tuberculosis and, although multiple-drug regimens containing rifampin and pyrazinamide are still recommended for the treatment of active tuberculosis, the ATS, CDC, and IDSA now state that regimens containing both rifampin and pyrazinamide generally should not be offered for the treatment of latent tuberculosis in either HIV-infected or HIV-negative individuals. The American Academy of Pediatrics (AAP) also states that the 2-month rifampin and pyrazinamide regimen is not recommended for children. Based on a recent analysis of potential cofactors in patients with latent tuberculosis who developed hepatotoxicity while receiving a regimen of rifampin and pyrazinamide, this regimen should never be offered to patients who are currently taking other drugs associated with liver injury, patients who drink excessive amounts of alcohol (even if alcohol is discontinued during treatment), or patients with underlying liver disease or a history of isoniazid-associated liver injury. However, the ATS, CDC, and IDSA state that a rifampin and pyrazinamide regimen might be considered for the treatment of latent tuberculosis in carefully selected patients if the potential benefits of the regimen outweigh the risk for severe liver injury and death, but only when the preferred or alternative regimens (i.e., 9-month isoniazid regimens, 6-month isoniazid regimens, 4-month daily rifampin regimen) are judged unlikely to be completed and oversight can be provided by a clinician with expertise in the treatment of latent tuberculosis. An expert in the treatment of latent tuberculosis should be consulted before a regimen of rifampin and pyrazinamide is offered. If a rifampin and pyrazinamide regimen is used, patients should be informed of the potential for hepatotoxicity and certain precautions should be taken to ensure that the patient is closely monitored for adherence, tolerance, and adverse effects throughout the entire course of therapy. When use of rifampin is being considered for the treatment of latent tuberculosis infection in HIV-infected patients, the possibility that certain combinations of drugs might be contraindicated or drug dosages may have to be altered because of clinically important pharmacokinetic interactions between rifampin and certain antiretroviral agents (e.g., HIV protease inhibitors, NNRTIs) should be considered. (See Drug Interactions: Antiretroviral Agents.) The ATS and CDC state that while therapy for latent tuberculosis infection with rifabutin in tuberculin-positive patients with HIV infection has not been evaluated in clinical trials, the use of rifabutin instead of rifampin in such regimens for treatment of latent M. tuberculosis infection is valid for the same scientific principles that support the use of rifabutin for the treatment of active tuberculosis. However, the ATS and CDC state that substitution of rifapentine, a long-acting rifamycin, for rifampin in treatment regimens for latent tuberculosis infection currently is not recommended because the safety and efficacy of rifapentine in HIV-infected patients have not been established and drug interactions between rifapentine and protease inhibitors have not been adequately evaluated. For HIV-infected adults who are receiving concomitant antiretroviral therapy that includes protease inhibitors or NNRTIs, recommended regimens for treatment of latent M. tuberculosis infection are a 9-month regimen of isoniazid given daily or twice weekly; a 4-month regimen of rifabutin given daily; or a 2-month regimen of rifabutin and pyrazinamide given daily. For HIV-infected adults who are not receiving concomitant protease inhibitors or NNRTIs, recommended regimens for treatment of latent M. tuberculosis infection are the same as those for adults without HIV infection (i.e., usually a 9-month regimen of isoniazid given daily or twice weekly or a 4-month regimen of rifampin given daily). The preferred regimen for treatment of latent tuberculosis infection in pregnant women is a 6- or 9-month regimen of isoniazid monotherapy; those with HIV infection or radiographic evidence of prior tuberculosis should receive 9 rather than 6 months of isoniazid therapy. The ATS and CDC state that rifampin has been used to treat active tuberculosis in pregnant women but there are no efficacy data to date to support use of the drug for treatment of latent tuberculosis infection in pregnant women. In addition, the ATS and CDC state that use of pyrazinamide can be considered in HIV-infected pregnant women after the first trimester of pregnancy but should be avoided in other pregnant women. In individuals likely to be infected with M. tuberculosis that are resistant to both isoniazid and rifampin and who are at high risk for developing tuberculosis, the ATS and CDC recommend regimens consisting of pyrazinamide and ethambutol or pyrazinamide and a quinolone anti-infective (e.g., levofloxacin or ofloxacin) for 6-12 months if the organisms from the index case are known to be susceptible to these drugs. Immunocompetent contacts may be managed by observation alone or be treated with such regimens for 6 months; immunosuppressed individuals, including those with HIV infection, should be treated for 12 months. Clinicians should review the drug-susceptibility pattern of M. tuberculosis isolated from the infecting source-patient before selecting a regimen for treating potentially multiple-drug resistant tuberculosis infections. In individuals likely to have been infected with M. tuberculosis that are resistant to both isoniazid and rifampin, the choice of drugs used for treatment of latent infection requires expert consultation. Prior to initiation of therapy for latent tuberculosis infection in patients with suspected multidrug-resistant tuberculosis, careful assessment to rule out active disease is necessary. The AAP states that, until susceptibility test results are available, both rifampin and isoniazid should be given to contacts who are likely to have been infected by an index case with isoniazid-resistant tuberculosis. If the index case is proven to be excreting organisms that are completely resistant to isoniazid, isoniazid should be discontinued and rifampin given for a total of at least 6 months. The AAP recommends consultation with an expert in making decisions about therapy for latent tuberculosis infection in children with isoniazid and/or rifampin-resistant M. tuberculosis. Individuals who undergo hematopoietic stem cell transplant (HSCT) are at increased risk for progression from latent tuberculosis infection to active disease because of immunosuppression. The CDC, IDSA, and the American Society of Blood and Marrow Transplantation (ASBMT) have established guidelines for preventing opportunistic infections in HSCT recipients. These guidelines include recommendations regarding treatment of latent tuberculosis in HSCT candidates and recipients. All HSCT candidates should be screened for active and latent tuberculosis infection; although a tuberculin skin test can be administered, this test may not be reliable in patients who are immunocompromised. 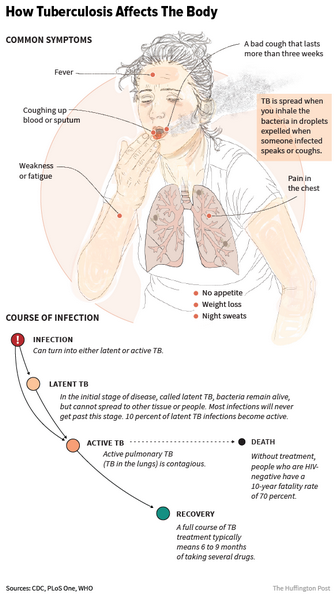 Therefore, clinicians should not rely solely on the test to determine whether latent tuberculosis infection is present and whether preventive therapy should be administered. 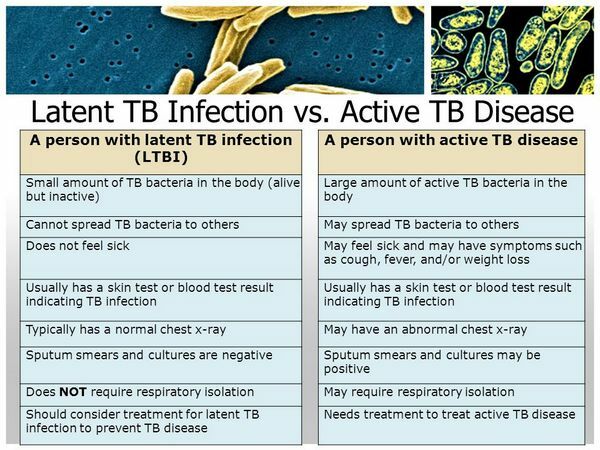 The CDC, IDSA, and ASBMT state that a regimen for the treatment of latent tuberculosis infection should be administered to all immunocompromised HSCT recipients or candidates (adults, adolescents, and children) who have been substantially exposed to someone with active, infectious (i.e., sputum-smear positive) pulmonary or laryngeal tuberculosis, regardless of tuberculin skin test results, and also should be administered to all HSCT recipients or candidates who have a positive skin test result and have not previously been treated and have no evidence of active tuberculosis. A 9-month regimen of daily isoniazid monotherapy is the regimen of choice when treatment of latent tuberculosis infection is indicated in HSCT candidates or recipients. The 2-month regimen of daily rifampin and pyrazinamide is not recommended for HSCT candidates or recipients because of limited safety and efficacy data in these individuals, risk of hepatotoxicity, and substantial drug interactions that have been reported between rifampin and several drugs used in HSCT patients (e.g., cyclosporine, tacrolimus, corticosteroids, fluconazole).The guidelines for preventing opportunistic infections in HSCT recipients should be consulted for additional information on preventing opportunistic infections in these patients and for information on hospital infection control, strategies for safe living after transplantation, and hematopoietic stem cell safety. The ATS and CDC state that completion of therapy for latent tuberculosis infection is based on the total number of administered doses of the antituberculosis agents, not the duration of therapy alone. If rifampin monotherapy regimen is used, at least 120 doses should be administered within 6 months. If a regimen in which a rifamycin (rifampin or rifabutin) and pyrazinamide is given daily, at least 60 doses should be administered within 3 months. Ideally, patients should receive the treatment regimens on a regular dosing schedule until completion of the indicated course; in practice, some doses may be missed requiring the course to be lengthened. Reinstitution of therapy in patients whose treatment has been interrupted might require a continuation of the regimen originally prescribed (as long as needed to complete the recommended duration of the particular regimen) or a complete renewal of the regimen if interruptions were frequent or prolonged enough to preclude completion of treatment as recommended. In either situation, when therapy is resumed after an interruption of 2 months or longer, a medical examination is indicated to rule out tuberculosis disease. All patients receiving an intermittent (e.g., twice-weekly) dosing regimen for the treatment of latent tuberculosis infection should receive directly observed therapy (DOT). In addition, the ATS and CDC state that, when feasible, DOT also should be used in patients receiving 2-month regimens and in some special settings (e.g., some institutional settings, community outreach programs, household contacts of patients with tuberculosis who are receiving home-based DOT). Rifampin is used as an alternative to rifabutin in multiple-drug regimens for the treatment of Mycobacterium avium complex (MAC) pulmonary infections. The ATS currently recommends that therapy for MAC pulmonary infections in HIV-negative adults consist of at least 3 drugs, including clarithromycin (500 mg twice daily) or azithromycin (250 mg daily or 500 mg 3 times weekly), rifabutin (300 mg daily) or rifampin (600 mg daily), and ethambutol (25 mg/kg daily for 2 months, then 15 mg/kg daily). The ATS states that the addition of streptomycin given intermittently (2 or 3 times weekly for at least 2 months) may be considered for patients with extensive disease. When use of rifampin is being considered for the treatment of MAC infection in HIV-infected patients, the possibility that drug regimens or dosages may have to be altered because of clinically important pharmacokinetic interactions between rifampin and certain antiretroviral agents (e.g., HIV protease inhibitors, NNRTIs) should be considered. Rifampin is used to eliminate meningococci from the nasopharynx of asymptomatic Neisseria meningitidis carriers. The drug also is used for chemoprophylaxis in close contacts of individuals with invasive meningococcal disease when the risk of infection is high. Rifampin is not indicated for the treatment of N. meningitidis infections since rapid emergence of resistant strains of the organism may occur during long-term therapy with the drug.IV penicillin G generally is considered the drug of choice for the treatment of invasive disease caused by N. meningitidis and ceftriaxone or cefotaxime are alternative agents. Rifampin should not be used indiscriminately to eliminate meningococci from the nasopharynx of asymptomatic N. meningitidis carriers and should be used only when the risk of meningococcal meningitis is high. To avoid indiscriminate use of the drug, diagnostic laboratory procedures, including serotyping and susceptibility testing, should be performed to determine whether the carrier state exists and the appropriate drug therapy. Rifampin generally has been considered the drug of choice and is 72-90% effective in eradicating nasopharyngeal carriage of N. meningitidis. Alternatively, a single IM dose of ceftriaxone reportedly is 97-100% and a single oral dose of ciprofloxacin is 90-95% effective in eradicating nasopharyngeal carriage of the organism. When sporadic or cluster cases of meningococcal disease occur in the US, chemoprophylaxis is the principal means of preventing secondary cases in household and other close contacts of individuals with invasive disease. Recommended regimens for chemoprophylaxis against meningococcal disease include 2 days of oral rifampin therapy (not recommended in pregnant women), a single IM dose of ceftriaxone, or a single oral dose of ciprofloxacin (not recommended in individuals younger than 18 years of age unless no other regimen can be used and not recommended for pregnant or lactating women). Although the AAP suggests that rifampin is the drug of choice for chemoprophylaxis in most instances, the CDC states that rifampin, ciprofloxacin, and ceftriaxone are all 90-95% effective and are all acceptable regimens for chemoprophylaxis. Sulfisoxazole is no longer included in CDC or AAP guidelines for chemoprophylaxis of meningococcal disease. The attack rate for household contacts who do not receive chemoprophylaxis has been estimated to be 4 cases per 1000 individuals exposed, which is 500-800 times greater than that for the general population. A decision to administer chemoprophylaxis to close contacts of an individual with invasive meningococcal disease is based on the degree of risk. Throat and nasopharyngeal cultures are not useful in determining the need for chemoprophylaxis and may unnecessarily delay administration of the regimen. The CDC and AAP currently recommend that chemoprophylaxis be administered to contacts of individuals with invasive meningococcal disease only when the contacts are considered at high risk of infection. These high-risk individuals include household contacts (especially young children) and any individual who has slept or eaten frequently in the same dwelling with the index case; child care and nursery school contacts who were exposed during the 7 days before the onset of disease in the index case; individuals exposed directly to oropharyngeal secretions of the index case (e.g., through kissing or sharing toothbrushes, eating utensils, or drinking containers) during the 7 days before the onset of disease in the index case; and medical personnel who had intimate exposure (e.g., through mouth-to-mouth resuscitation, unprotected contact during endotracheal intubation or suctioning) to the index case during the 7 days before the onset of disease. Chemoprophylaxis isnot routinely recommended for contacts considered at low risk of infection. Individuals considered in most circumstances as being at low risk include casual contacts with no history of direct exposure to the index case’s oral secretions (e.g., school or work contacts); individuals who had only indirect contact with the index case (only contact was with a high-risk contact of the index case); and medical personnel who had no direct exposure to the index case’s oral secretions. When chemoprophylaxis is indicated in high risk contacts, it must be administered promptly (ideally within 24 hours after identification of the index case) since the attack rate of secondary disease is greatest in the few days following disease onset in the index case. All high-risk contacts should be informed that even if chemoprophylaxis is taken or started, the development of any suspicious clinical manifestation warrants early, rapid medical attention. Chemoprophylaxis probably is of limited or no value if administered more than 2 weeks after contact with the index case. If high-risk exposure to a new index case occurs more than 2 weeks after initial chemoprophylaxis, additional treatment is indicated. When an outbreak of meningococcal disease occurs in the US and the outbreak is caused by a vaccine-preventable meningococcal strain (i.e., serogroups A, C, Y, or W-135), large-scale vaccination programs with meningococcal polysaccharide vaccine in the appropriate target group is the principal control measure. (See Uses: Outbreak Control in Meningococcal Polysaccharide Vaccine 80:12.) Mass chemoprophylaxis programs (e.g., with rifampin, ceftriaxone, ciprofloxacin) in large population groups is not effective in most settings in which organization- or community-based outbreaks have occurred and disadvantages of such programs (e.g., costs, difficulty in ensuring simultaneous administration of the drugs to large populations, adverse effects of the drugs, emergence of resistant organisms) probably outweigh any possible benefit in disease prevention. However, when outbreaks involve small populations (e.g., a small organization such as a single school), administration of chemoprophylaxis to all individuals in the population may be considered. The CDC states that other measures, such as restricting travel to areas with a suspected meningococcal outbreak, closing schools or universities, or canceling sporting or social events, are not recommended to control meningococcal outbreaks in the US. In one reported outbreak of serogroup B meningococcal disease (a strain that cannot be prevented with currently available meningococcal polysaccharide vaccine) in a middle school, mass chemoprophylaxis with rifampin was 85% effective in eradicating carriage of meningococci and appeared to decrease transmission of the disease; however, rifampin-resistant isolates of N. meningitidis were recovered from some individuals who were carrying rifampin-susceptible strains prior to chemoprophylaxis. While the vast majority of cases of meningococcal disease in the US are sporadic, the frequency of outbreaks of group C meningococcal disease has increased in the US and Canada since 1991 and there also have been small outbreaks as well as statewide epidemics caused by serogroup B. As a result, the CDC has published guidelines for the evaluation and management of suspected meningococcal outbreaks that can be used by US public health professionals (e.g., epidemiologists in state and local health departments), and these guidelines can be consulted for further information. In addition, the Childhood and Respiratory Diseases Branch, Division of Bacteria and Mycotic Diseases, National Center for Infectious Diseases, CDC can be consulted on these and other issues regarding meningococcal disease 404-639-2215or 404-639-3311). Rifampin is used for chemoprophylaxis in contacts of patients with Haemophilus influenzae type b (Hib) infection. Rifampin is effective for eradicating oropharyngeal carriage of H. influenzae type b and is currently considered the most effective antimicrobial agent for eradicating carriage of the organism. Unvaccinated household contacts of an individual with Hib infection are at increased risk of infection if they are younger than 4 years of age. In addition, asymptomatic colonization with Hib occurs more frequently in household contacts of all ages than in the general population. Rifampin is approximately 95% effective in eradicating Hib from the pharynx of carriers, and limited data indicate that rifampin prophylaxis also decreases the risk of secondary invasive illness in exposed household contacts. Although child-care and nursery school contacts of an individual with Hib infection also may be at increased risk of secondary disease, experts disagree about the magnitude of the risk. The risk of secondary disease in children attending child-care centers seems to be lower than that observed for age-susceptible household contacts, and secondary disease in child-care contacts is rare when all contacts are older than 2 years of age. Efficacy of rifampin in preventing disease in child-care groups is not established. Rifampin prophylaxis is recommended for all household contacts, irrespective of age (except pregnant women), in those households with at least one contact younger than 48 months of age who is incompletely vaccinated against Hib. (A household contact is an individual residing in the residence of the infected [index] patient or a nonresident who spent 4 or more hours with the infected patient for at least 5 of the 7 days preceding hospital admission of the infected patient.) Rifampin prophylaxis generally is not necessary in households where all children younger than 48 months of age have completed primary immunization with a Hib vaccine. However, rifampin prophylaxis is recommended when there is a child residing in the house who is younger than 12 months of age, irrespective of the vaccination status of the child. The index patient should also receive prophylaxis, (unless they received cefotaxime or ceftriaxone for treatment of the infection); chemoprophylaxis usually is provided just before discharge. Rifampin prophylaxis is not recommended for those households in which all contacts are 48 months of age or older. Prophylaxis should be initiated as soon as possible, since the majority of secondary cases in households occur in the first week after hospitalization of the index patient. The time of occurrence of the remaining secondary cases after this time suggests that prophylaxis of household contacts initiated 7 days or longer after hospitalization of the index patient may still be of some, although not optimal, benefit. All attendees and supervisory personnel of child-care and nursery schools should receive rifampin if 2 or more cases of invasive disease have occurred within 60 days and there are unvaccinated or incompletely vaccinated children attending the facility. When a single case has occurred, the advisability of rifampin prophylaxis in exposed child-care groups with unvaccinated or incompletely vaccinated children is controversial, but many experts recommend no prophylaxis. When rifampin prophylaxis is indicated for household contacts or contacts in a child-care or nursery school facility, the drug should be given to children who have received Hib vaccine as well as susceptible, unvaccinated children. Although children who have received Hib vaccine are probably at decreased risk for development of Hib disease, the vaccine, unlike rifampin, does not appear to substantially affect nasopharyngeal carriage of H. influenzae type b.
Rifampin prophylaxis is not recommended for pregnant women who are contacts of affected infants since the effect of the drug on the fetus has not been established. The US Public Health Service Advisory Committee on Immunization Practices (ACIP) also considers rifampin the drug of choice for chemoprophylaxis in contacts of patients with Hib infections. ACIP recommendations for use of rifampin prophylaxis in household contacts of patients with Hib infections are the same as the above AAP recommendations; however, the ACIP recommendations for prophylaxis in contact groups in day-care facilities differ slightly from those of the AAP. The ACIP states that although unexplained disparities in available data prevent a precise estimate of the magnitude of risk among day-care contacts, it is likely that the increased risk of disease observed among young household contacts is also present among day-care classroom contacts younger than 2 years of age. The ACIP recommends that in day-care classrooms in which a case of Hib disease has occurred and in which another child younger than 2 years of age has been exposed, all parents should be notified (preferably in writing) regarding the occurrence of the case and the possibility of increased risk to their children. They should be informed about the symptoms and the need for prompt medical evaluation if symptoms occur. They should also be notified of the availability of rifampin prophylaxis. Although the data on which to base recommendations are not optimal, and some authorities disagree, the consensus of the ACIP is that strong consideration should be given to administering rifampin prophylaxis to all children and staff (regardless of age) in a day-care classroom in which a case of systemic Hib disease has occurred and in which one or more children younger than 2 years of age have been exposed. Although some clinicians agree with the ACIP recommendations concerning use of rifampin prophylaxis in day-care contacts even when there is only a single primary case of Hib disease, other clinicians state that epidemiologic studies have shown that there may be substantial regional differences in the rate and time of subsequent disease in classroom contacts of patients with disease and that routine use of rifampin prophylaxis for all contacts in day-care facilities after a primary case is not justified. Rifampin is used in conjunction with other anti-infective agents in multiple-drug regimens for the treatment of multibacillary leprosy, paucibacillary leprosy, and single-lesion paucibacillary leprosy. While single-drug regimens (e.g., dapsone monotherapy) were used in the past for the treatment of leprosy, the World Health Organization (WHO) and most clinicians currently recommend that rifampin-based multiple-drug regimens be used for the treatment of all forms of leprosy. These rifampin-based multiple-drug regimens generally are effective, well tolerated, and relatively inexpensive. They may reduce infectiousness of the patient more rapidly than single-drug regimens and may delay or prevent the emergence of resistant organisms. Rifampin-based multiple-drug regimens are necessary because of the increasing incidence of dapsone-resistant Mycobacterium leprae, and these regimens are designed to be effective against all strains of M. leprae, regardless of their susceptibility to dapsone. Because rifampin is bactericidal against M. leprae, once-monthly administration of rifampin is the principal component of currently recommended multiple-drug regimens; dapsone and clofazimine are included in the regimens to prevent the emergence of rifampin-resistant M. leprae. Rifampin reportedly has greater bactericidal efficacy against M. leprae than any other single drug or combination of drugs that does not include rifampin, and once-monthly administration of rifampin is almost as effective against M. leprae as once-daily administration of the drug. The WHO states that elimination of M. leprae in patients receiving multiple-drug therapy principally is due to the bactericidal effect of the first several monthly doses of rifampin. The relapse rate in leprosy patients treated with rifampin-based multiple-drug regimens appears to be low. The WHO states that retreatment with currently recommended multiple-drug regimens generally has been effective in reported cases of relapse, and rifampin-resistant strains of M. leprae have not been detected in relapsing patients. However, the susceptibility of M. leprae to rifampin has not been determined routinely in such patients and the true incidence of rifampin-resistant strains is unknown. Although rifampin-resistant M. leprae has been reported in a limited number of patients, these principally have been from areas where rifampin was administered either alone or with dapsone to patients with dapsone-resistant M. leprae. Therefore, the WHO states that rifampin-resistant strains of M. leprae currently is not a serious concern, but selective noncompliance with the recommended dapsone and/or clofazimine components of the multiple-drug regimens may facilitate emergence of such strains. Further, the WHO states that use of monotherapy with any one antileprosy agent uniformly results in development of resistance to that drug. Because there is no specific vaccine available for the prevention of leprosy, early detection and effective treatment of all forms of the disease are the most effective measures available to prevent the spread of leprosy. However, while early detection and effective treatment may interrupt disease amplification within, and transmission by, human hosts and may prevent deformity in the individual with leprosy, it may not eliminate the disease. Leprosy (particularly multibacillary leprosy) patients are considered to be the principal source of new infection, and initiation of effective rifampin-based multiple-drug treatment rapidly stops shedding of M. leprae in nasal and upper respiratory secretions of leprosy patients, making them noninfectious. However, the epidemiologic effect of multiplication of M. leprae in humans is unknown; transmission continues to occur in areas where nonlepromatous patients predominate, and it is unclear whether asymptomatic infected individuals transmit infection. The exact modes of transmission and entry into susceptible individuals also are unknown, and the effects of socioeconomic and environmental factors on maintaining a leprosy epidemic are unclear. In addition, reservoirs of infection have been identified in species other than humans, and M. leprae may persist in soil or vegetation. Until recently, the WHO and other clinicians recommended that multiple-drug therapy for the treatment of multibacillary leprosy be administered for 24 months. Because there is evidence that rifampin-based multiple-drug therapy is effective for the treatment of multibacillary leprosy even when the drugs are taken irregularly or for a substantially shorter duration, the WHO has revised their recommendations and currently states that a 12-month regimen of rifampin-based multiple-drug therapy can be used in most patients with multibacillary leprosy. A 6-month rifampin-based multiple-drug regimen is recommended for the treatment of paucibacillary leprosy, and a single-dose, rifampin-based multiple-drug regimen may be used in selected groups of patients with single-lesion paucibacillary leprosy. Effective treatment of leprosy depends on compliance with the recommended multiple-drug regimens, and the WHO recommends supervised administration of some drug doses included in the regimens (e.g., once-monthly doses). However, the level of health-care services is inadequate in some countries where leprosy is endemic, and early supervision guidelines (i.e., monthly attendance on fixed days at leprosy clinics) proved to be unnecessarily rigid since it is not always possible for a health-care worker to supervise monthly drug administration. Although logistic problems associated with prolonged courses of administration remain, an alternative is to identify a family or community member who can supervise monthly drug administration when it is not possible for a health-care worker to do so. The WHO states that it may be assumed that individuals who show up for diagnosis and treatment may be considered to be sufficiently motivated to take full responsibility for their own care, provided they are appropriately educated regarding the importance of taking the daily and monthly components of multiple-drug therapy and the necessary duration of treatment. In such cases, more than a one-month supply of WHO-recommended drugs in blister packs may be provided to the patient. The WHO states that multibacillary leprosy patients who have received 12 months of the recommended multiple-drug regimen or paucibacillary leprosy patients who have received 6 months of the recommended multiple-drug regimen usually can be considered cured. In patients who have been noncompliant, the multiple-drug regimens can be reinitiated and continued to complete the total number of recommended months of therapy (i.e., 12 or 6 months); however, patients who have been noncompliant for 12 consecutive months should be treated with an entirely new course of the recommended 12- or 6-month multiple-drug regimens. For the treatment of multibacillary leprosy (i.e., more than 5 lesions or skin smear positive for acid-fast bacteria), the WHO currently recommends a 12-month multiple-drug regimen of rifampin, clofazimine, and dapsone. Although the WHO and some clinicians state that 12 months of the recommended rifampin-based multiple-drug regimen is adequate for most multibacillary patients, there is concern that a 12-month regimen may not be of sufficient duration to be effective in patients with a high bacterial index. Therefore, the WHO currently recommends that after completing 12 months of treatment, a patient with a high bacterial index demonstrating no improvement and with evidence of deterioration should receive an additional 12 months of the multiple-drug regimen. If a patient with multibacillary leprosy receiving the recommended rifampin-based multiple-drug regimen experiences severe adverse effects related to dapsone, the WHO states that dapsone may be discontinued and therapy continued with rifampin and clofazimine given in their usually recommended dosages. Ofloxacin and minocycline are bactericidal against M. leprae and are considered alternative agents that can be used in multibacillary leprosy patients who will not accept or cannot tolerate clofazimine or cannot receive rifampin because of a contraindication (e.g., hypersensitivity) or intolerance, intercurrent disease (e.g., chronic hepatitis), or infection with rifampin-resistant M. leprae. Clarithromycin has substantial bactericidal activity against M. leprae and has been used in the treatment of leprosy; however, clarithromycin has not been well tolerated in many patients, which limits its potential as an alternative drug. Although ethionamide was previously recommended as an alternative agent for use in multiple-drug regimens, it is associated with severe hepatotoxicity and the WHO no longer recommends use of the drug as an alternative to clofazimine in multiple-drug regimens. For the treatment of paucibacillary leprosy (i.e., 2-5 lesions), the WHO recommends a 6-month regimen of rifampin and dapsone. If a patient experiences severe adverse effects related to dapsone, dapsone may be discontinued and clofazimine substituted; the WHO recommends that clofazimine be administered for a duration of 6 months at the same dosage used in the treatment of multibacillary leprosy. Patients with single-lesion paucibacillary leprosy (i.e., a single skin lesion with definite loss of sensation but without nerve trunk involvement) have been effectively treated with a single-dose rifampin-based multiple-drug regimen (ROM) that includes a single dose of rifampin, a single dose of ofloxacin, and single dose of minocycline. The single-dose ROM regimen was evaluated in a double-blind controlled study. Patients received the 6-month rifampin and dapsone regimen usually recommended for paucibacillary leprosy with single doses of placebo or received single doses of rifampin, ofloxacin, and minocycline and a 6-month regimen of placebo; patients were followed for an additional 12 months to determine response to treatment. Results at 18-month follow-up indicated that 51.% of patients receiving the single-dose ROM regimen had marked improvement compared with 57.% of those receiving the 6-month regimen. A complete cure (disappearance of the lesion and associated signs) was attained in 469 or 54.% of those receiving the single-dose ROM or 6-month regimen, respectively. Treatment failure (i.e., no change or an increase in symptoms) occurred in 0.9% of patients in both treatment groups, and the incidence of adverse effects and leprosy reactions did not differ substantially between the groups. Because the single-dose ROM regimen was almost as effective as the standard 6-month regimen in this study, and due to the considerable logistic advantage of a single-dose regimen compared with the 6-month regimen, the WHO states that the single-dose ROM regimen is an acceptable and cost-effective alternative regimen for the treatment of single-lesion paucibacillary leprosy in antileprosy programs that have detected a large number of patients (e.g., more than 1000 annually) with single-lesion paucibacillary leprosy. Use of the single-dose ROM regimen is considered to be especially advantageous in countries such as India, where over 50% of newly diagnosed leprosy patients are classified as having single-lesion leprosy. However, the WHO states that the single-dose ROM regimen should not be used in antileprosy programs that have detected few single-lesion paucibacillary patients since it involves additional logistic and information reporting problems for these programs. Because results of the controlled study indicated that the 6-month multiple-drug regimen may be more effective, some clinicians suggest that the 6-month regimen may be preferred unless operational issues of an antileprosy program make the single-dose ROM regimen more feasible. In the US, the Gillis W. Long Hansen’s Disease Center at 800-642-2477 should be contacted for further information on the treatment of leprosy. Strains of Bacillus anthracis that were associated with cases of inhalational or cutaneous anthrax that occurred in the US (Florida, New York, District of Columbia) during September and October 2001 in the context of an intentional release of anthrax spores (biologic warfare, bioterrorism) were susceptible to rifampin in vitro. Although limited clinical data are available regarding use of rifampin in the treatment of anthrax, rifampin was included in several multiple-drug regimens used in the treatment of patients who developed inhalational anthrax following these bioterrorism-related anthrax exposures. These multiple-drug regimens include ciprofloxacin, rifampin, and clindamycin; ciprofloxacin, rifampin, and vancomycin; and ciprofloxacin, rifampin, and penicillin G. At least 2 patients who survived received a parenteral regimen of ciprofloxacin (400 mg every 8 hours), rifampin (300 mg every 12 hours), and clindamycin (900 mg every 8 hours) for treatment. Because of the rapid course of symptomatic inhalational anthrax and high mortality rate, prompt recognition of symptoms and early initiation of anti-infective therapy is essential. The CDC and other experts (e.g., US Working Group on Civilian Biodefense) recommend that treatment of inhalational anthrax that occurs as the result of exposure to anthrax spores in the context of bioterrorism should be initiated with a multiple-drug parenteral regimen that includes ciprofloxacin or doxycycline and 1 or 2 other anti-infectives predicted to be effective. Based on in vitro data, drugs that have been suggested as possibilities to augment ciprofloxacin or doxycycline in such multiple-drug regimens include rifampin, chloramphenicol, clindamycin, vancomycin, clarithromycin, imipenem, penicillin, or ampicillin. If meningitis is established or suspected, some clinicians suggest a multiple-drug regimen that includes ciprofloxacin (rather than doxycycline) and chloramphenicol, rifampin, or penicillin. Multiple-drug parenteral regimens also are recommended for the treatment of cutaneous anthrax if there are signs of systemic involvement, extensive edema, or lesions on the head and neck. For information on treatment of anthrax and recommendations for prophylaxis following exposure to anthrax spores. Rifampin has been used in the treatment of infections caused by Bartonella henselae (e.g., cat scratch disease, bacillary angiomatosis, peliosis hepatitis). Cat scratch disease generally is a self-limited illness in immunocompetent individuals and may resolve spontaneously in 2-4 months; however, some clinicians suggest that anti-infective therapy be considered for acutely or severely ill patients with systemic manifestations, particularly those with hepatosplenomegaly or painful lymphadenopathy, and such therapy probably is indicated in immunocompromised patients. Anti-infectives also may be indicated in patients with B. henselae infections who develop bacillary angiomatosis, neuroretinitis, or Parinaud’s oculoglandular syndrome. While the optimum anti-infective regimen for the treatment of cat scratch disease or other B. henselae infections has not been identified, some clinicians recommend use of azithromycin, ciprofloxacin, erythromycin, co-trimoxazole, doxycycline, gentamicin, or rifampin. A regimen of erythromycin or doxycycline with or without rifampin has been used successfully in the treatment of B. henselae ocular infections. Rifampin is used as an adjunct to other anti-infective agents for the treatment of brucellosis. Tetracyclines generally are considered the drugs of choice for the treatment of brucellosis; however, concomitant use of another anti-infective (e.g., streptomycin or gentamicin and/or rifampin) may reduce the likelihood of disease relapse and usually is recommended in serious infections or when there are complications such as meningitis, endocarditis, or osteomyelitis. Some experts recommend a 3-drug regimen that includes a tetracycline, an aminoglycoside, and rifampin for the treatment of brucellosis in patients with meningoencephalitis or endocarditis. Rifampin should not be used alone in the treatment of brucellosis. Although many clinicians consider doxycycline and streptomycin (or gentamicin) the regimen of choice for the treatment of brucellosis, other experts recommend a regimen of a tetracycline (doxycycline) and rifampin. There is some evidence that the doxycycline-rifampin regimen may be less effective than the doxycycline-streptomycin regimen in some patients, possibly because of a pharmacokinetic interaction between rifampin and doxycycline that results in decreased plasma concentrations of the tetracycline. Although data are limited, alternative regimens that have been suggested for the treatment of brucellosis include co-trimoxazole with or without gentamicin or rifampin (recommended for use in children when tetracyclines are contraindicated); ciprofloxacin (or ofloxacin) and rifampin; and chloramphenicol with or without streptomycin. Postexposure prophylaxis with anti-infectives is not generally recommended after possible exposure to endemic brucellosis; however, use of an anti-infective regimen recommended for the treatment of brucellosis (e.g., doxycycline and rifampin) should be considered following a high-risk exposure to Brucella. These high-risk exposures include needle-stick injuries involving the brucella vaccine available for veterinary use (a brucella vaccine for use in humans is not available); inadvertent laboratory exposure to the organism; or confirmed exposure in the context of biologic warfare or bioterrorism. Although doxycycline is considered the drug of choice for infections caused by Ehrlichia, rifampin is an alternative for the treatment of infections caused by E. phagocytophilia. In the treatment of infections caused by Legionella pneumophila (Legionnaires’ disease), rifampin is used as an adjunct to a macrolide (e.g., azithromycin, erythromycin), a fluoroquinolone (e.g., ciprofloxacin, ofloxacin, levofloxacin), or a tetracycline (e.g., doxycycline). Many clinicians consider azithromycin or a fluoroquinolone to be the preferred drugs for the treatment of Legionnaires’ disease; some clinicians also consider erythromycin a drug of choice for this infection. A parenteral regimen usually is necessary for the initial treatment of severe disease, and rifampin may be added to the initial regimen in severely ill and/or immunocompromised patients. If L. pneumophila is identified in patients with community-acquired pneumonia, the Infectious Diseases Society of America (IDSA) recommends use of a macrolide (with or without rifampin) or a fluoroquinolone or, alternatively, a regimen of doxycycline (with or without rifampin). Rifampin is used in conjunction with vancomycin for the treatment of infections caused by Rhodococcus equi. R. equi has been identified as a cause of pulmonary infections (e.g., lung abscess) in immunocompromised individuals such as solid organ transplant recipients or patients with HIV infection. While optimum regimens for the treatment of these infections have not been identified, combination regimens usually are recommended. Some clinicians suggest that R. equi infections be treated with a regimen of vancomycin given with a fluoroquinolone, rifampin, a carbapenem (e.g., imipenem, meropenem), or amikacin. Rifampin is used as an adjunct to other anti-infective agents (e.g., third generation cephalosporins, vancomycin) for the treatment of serious infections such as bacteremia, pneumonia, and meningitis caused by penicillin-resistant Streptococcus pneumoniae or oxacillin-resistant Staphylococcus aureus or S. epidermidis (previously known as methicillin-resistant S. aureus or S. epidermidis). Rifampin should not be used alone in the treatment of these infections.